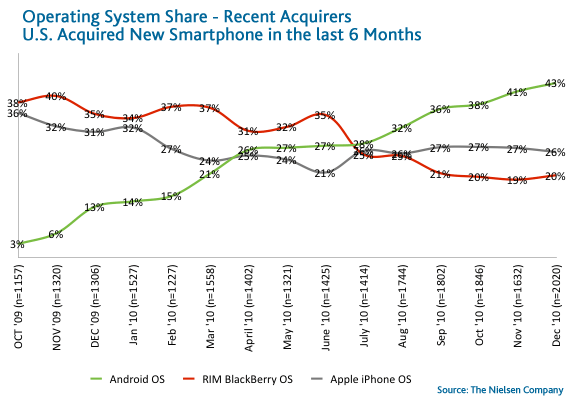 As I and many others predicted, Android continues its march upward to become the biggest smartphone OS in the world. 33 million Android smartphones were shipped in the 4th quarter of 2010, larger than any other platform – even Nokia. This has sparked Nokia to review their strategy and I would not be surprised if they soon ship an Android phone having seen how well HTC, Samsung and Motorola have done from it. Apple continues to make more money than anyone else, despite its market share plateauing at around 26-27% in the US. Their growth is coming from other new markets as well as the fundamental growth in the smartphone market itself (45-50% per year right now). At some point smartphones will become saturated at which point Apple will have to focus only on global growth and continue to work to get Apple users to upgrade annually. Inevitably its growth will have to slow at some point. The elephant in the room which no-one is talking about is how Google are ensuring they have massive control of the mobile search market. Google is playing a long-term game here – mobile advertising growth will soon mimic the growth of the smartphone. Google is leaving the hardware innovation to the experts, its only interest is ensuring it has the eyeballs of the phone users. Bing is Copying Google’s Search Results!